Some books leave you feeling warm & fuzzy, some leave you sad or thoughtful. This book left me with palpitations & an irrational fear of dentures. Elaine Buxton is having a really bad day. You’d think being abducted by a mad man would be your worst nightmare come true. Wrong. Unfortunately he has a few…um…procedures planned as part of his scheme to convince everyone she is dead. Luc Callanach is having a marginally better day. He recently left a job with Interpol under a cloud & has surfaced as a DI in Edinburgh. Rumours are swirling & he’s not exactly being embraced by his new team. The fact that he doesn’t want to be there is not helping. He’s called about a body found in a burned out bothy in the Caimgorms. It’s not his jurisdiction but there’s a chance it could be missing Edinburgh lawyer Elaine Buxton. They can’t know it yet but he & his team are about to come up against a devious & meticulous killer. More women will be taken & more will die as the killer hides in plain sight. We know his identity early on & he’s just one the characters who take turns narrating the story. Others include members of Luc’s squad & his colleague DI Ava Turner. She’s a smart, hard working cop & one of the few to reach out & welcome Luc to the force. Initially he rebuffs her friendship but as the story progresses her warm & straight forward manner begins to thaw his cool, prickly demeanour. She’s got a difficult investigation of her own concerning abandoned babies & they bounce ideas off each other as they struggle to crack the cases. So here’s the heads up. This is not for the faint of heart. Our killer is one of the most frightening you’ll come across in fiction & there are some gruesome scenes. What elevates this book above others in the genre is smooth, self assured prose & the depth of the characters. Dialogue is crisp & lean & I particularly enjoyed the rapport between Ava & Luc. No worries….you won’t find any cheesy insta-lust scenarios here. These are mature, well defined characters who gradually forge a friendship based on commonality & mutual respect. Ava sparkles with intelligence & wit & I enjoyed her ability to loosen up the tightly wound Luc. Their conversations are full of welcome humour that helps balance out the rising tension surrounding the fate of the abducted women. 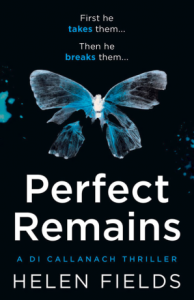 There are plenty of side stories dealing with Luc’s past & other characters that keep this ticking along at a steady pace until you hit the 3/4 mark. Then it becomes a sprint to the finish. It’s flat out addictive, one of those books you really resent having to put down & I stayed up waaay too late simply because I had to know how it ended (just ask coworkers who had to deal with my cranky self the next day). If you like your thrillers scary & smart, this is a stand out entry in grit-lit. Can’t wait for “Perfect Prey” due out in late June which gives me time to get over….you know….the denture thing.